Cricova is probably the best-known wine name of Moldova. The state-run winery includes an astonishing underground tunnel system, the labyrinth of galleries running for 120km, or about 75 miles. Most of Cricova’s production facilities are 60-80 metres underground, providing a constant, cool natural temperature and humidity for wine maturation. Cricova makes a great deal of traditional method sparkling wine in these cellars, but also a full range of dry and sweet wines. 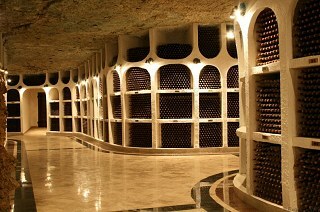 The ‘Circova Collection’ is an intriguing portfolio of wines, released only after decades of maturing in these cellars. Most of Cricova’s plantings are of ‘international’ varieties inlcuding Cabernet Sauvignon, Merlot, Pinot Noir and Chardonnay. There are also small amounts of local varieties like Rkatsiteli, familiar to me from my time judging the wines of neighbouring Georgia. Moldova shares a painful vinous link with Georgia. In 2006 its wines were banned by Russia – until then a major market. As with Georgia, the Russians claimed the wines were ‘contaminated’, but no evidence of this was produced. Co-incidentally however, both Georgia and Moldova were fighting a diplomatic war with Russia at the time over breakaway regions within each country – later to escalate into bloody conflict with Georgia in 2008. Happily, Russia approved Moldovan wines again in 2007, but by then an estimated $180 million had been lost from the Moldovan ecomony – already one of Europe’s poorest. This is a wine made using a method similar to making Port, with spirit added to wine that has partially fermented, whilst there is still plenty of sugar remaining. Made from Rkatsiteli, it pours a tawny colour and has an alluring aroma of sultanas, walnuts and leaf tea, with little nuances of honey and coffee. On the palate it is quite sweet, with a nice, medium-bodied freshness and plenty of lemon and orange acidity to lift it, whilst those soft, developed flavours of dried fruit, figs and honey build on the mid-palate. The finish shows a little spirity heat, but it is entirely in context and works beautifully in this wine. At £17.50 for a full 70cl bottle, a bargain for a mature and elegant wine such as this. 91/100.